Want to know specifics about practicing with us? 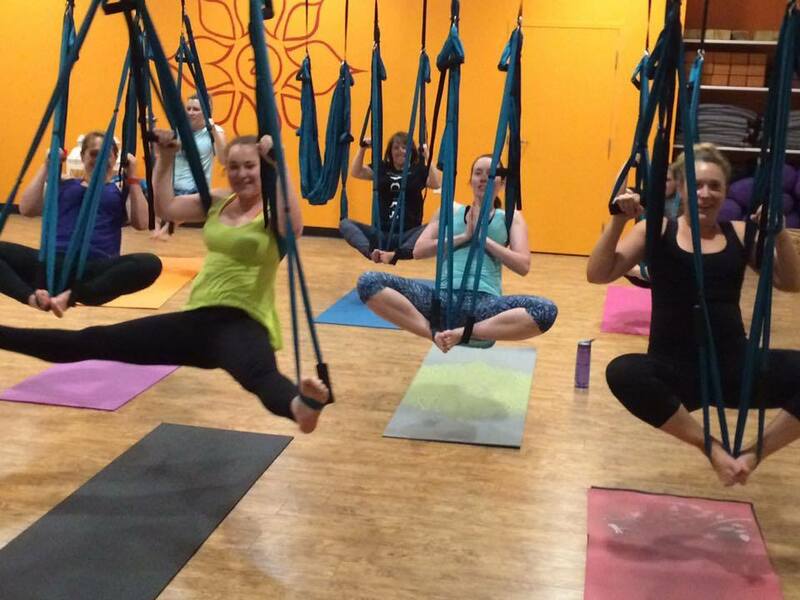 Thinking about joining us for your first Aerial Yoga practice at RedBloom? Feel free to download our Aerial Waiver below, fill it out ahead of time, and bring it with you! ​You are always welcome to fill out a waiver when you get to RedBloom if that works better! First Friday Flights- April Edition! Join us Friday, April 5th, for our "First Friday Flights"! We'll start with a fun-spirited, all-levels, beginner-friendly aerial yoga practice, then we'll gather for a social hour. Come float and fly (and laugh!) with us, then enjoy some yummy snacks and a cocktail! *Only a couple of hammocks left! Join us for a fun, all levels aerial yoga class in our Ascension Aerial Hammocks. This is an aerial yoga class, practiced entirely in or using a yoga hammock, which is securely hung from the ceiling and capable of fully supporting the body’s weight. This class is a fun, powerful way to explore new possibilities within your yoga practice. The swing will support you through deepening into poses you never imagined possible, while helping to align and deeply strengthen the body. You’ll get to go upside down with full support and allow the body to receive all the beautiful benefits of inversion without any weight on the spine. In this class you will play, explore, float, fly, strengthen and restore. No swing experience necessary. Some yoga experience is suggested. Expect extreme joy and a possible swing addiction. Teen Aerial Yoga "Hang Out"
Join Kris Batzner and RedBloom Yoga for a fun Aerial class just for Teens! Fly in one of our hammocks and learn cool tricks in a safe, structured environment. After class, hang out in our reading room with snacks and friends! A great way to spend a Saturday evening! Parental permission required but this is a teen only event! Call 989.317.0657 with questions or to reserve your spot! Look! RedBloom is featured in Episode 5 of Fit in the Mitt!